Review: I remember read the Invention of Hugo Cabaret, and falling into that story, and in the same way I did so here, which is such a great example of how a story can be told without words, and I found i was making up all the little bits of description as I was exploring the pictures. There was a beautiful fluidity to this, and to the text, but especially with you pictures you could just stare at one for a long as you want and really pace the story as you wanted which was fantastic. I think I stared at the Angel for about five minutes. And his characters! Selznick has this ability to create such realistic character that carry this beauty to them! The book is split with the first half-ish in pictures, with this beautiful story and the ending on a cliffhanger to jump a hundred years on and start Joseph's story in text which again I fell into...and then the twists! I didn't see them coming which was great and each time had me exclaiming and as the story unfolded I wanted to cry, to laugh for it to not end. I think it's safe to say this book was blooming brilliant! Last week, by chance more than anything else (and bad memory, so sometimes it does pay off!) I got to go to an event at Waterstones Piccadilly where Selznick...might just start calling him Brian. Hope that's ok everyone. Where Brian was talking about the book, and what a fantastic talk it was, and so I wanted to share as much of it as I could for everyone who couldn't be there. This is paraphrased to as much as I could type at the event! #disclaimer. The Marvels started off as a 100 page novella about the work of George Melies that then turned into a five hundred tomb. What originally was three pages of description was taken out and turned into 48 pages of images (amazing) that in many ways Brian wanted to create a sort of silent movie in a book. I love that he initially said that Hugo could never be turned into a book...and then Martin Scorsese calls and you can't really say no to that! 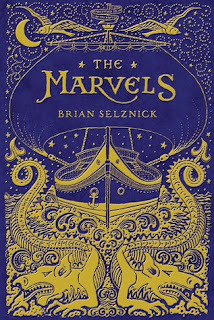 The Marvels, and indeed his other books is a Visual story telling single narrative handed back amd fourth with the images and text so it's a single arc so you hadn't remembered what you read and seen. After Hugo when he was approaching Book two he wanted to so something different with two separate ongoing tangents until they meet at the end, and voila Wonderstruck. The inspiration behind Wonderstrck came from documentary about deafness (at which point Brain starts signing as he spoke) and he wanted to bring that jnto the book because you experience life in a very different way so he told the story of the female character who is deaf in a very different way to the other story tangent. Selznick calls The Marvels his valentines to London. Lived in London for three months in am amazingly central flat, right down the road from the Theatre Royal Haymarket, which was an inspiration for the book (Selznick has wanted to be a set designer and has worked as a puppeteer which is something I really want to learn to do), as was that amazingly eclectic Dennis Sever's House (which everyone should go and experience). It's exactly as if the 18th century family that live there just left the room. A lot of his memories from his experiences were brought into the book, from the dragons as the old markers for London to the dog who became Tar. Then we have the fantastic trailer which he made himself with a few aides..including a specific perosn in charge of the shipwreck (love it) which you can check out below. I also love how when we watched it he bobbed along to the music of the tailer!!! It's catchy I'll give you that! 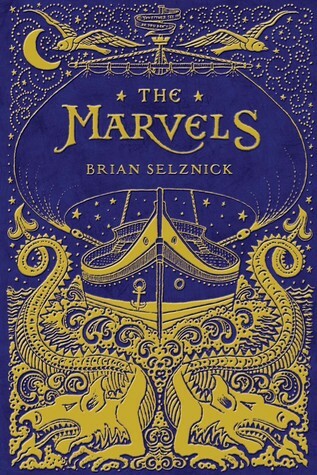 The Marvels is out now, deffo grab a copy...possibly some tissues also.